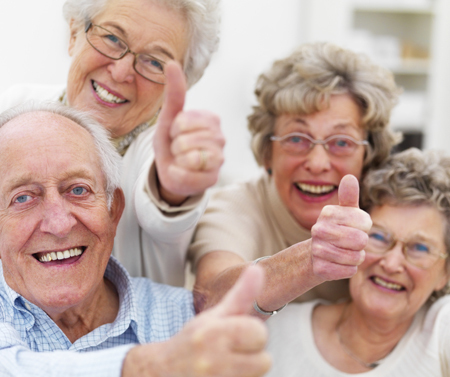 Senior dental patients have unique oral health goals and concerns. Many struggle with loose-fitting prosthetics, diminished oral function, and other health issues that impact their smiles. At Walker Square Dental, we help our senior patients maintain smiles they can feel good about while working to improve oral health, function, aesthetics, and comfort. We believe everyone, regardless of their age, deserves a beautiful, healthy and comfortable smile. In addition, if you are dealing with non-dental health problems that tie into oral health issues, like dry mouth caused by some medications, or digestive issues related to inability to bite and chew properly, Dr. Rogge can create an oral health regimen or treatment plan that will help correct, or minimize, these common, age-related oral health issues. For patients dealing with tooth loss and uncomfortable dental prosthetics, our dental team works with you to create new restorations – like full dentures, bridges, crown, and implants – that fit comfortably, look natural, and allow you to enjoy much improved oral function. No one, regardless of age, should have to deal with loose dentures, chipped crowns, or yellowing prosthetics. Visiting the dentist twice a good year is a good general rule of thumb. However, many senior patients, such as those with gum disease, need more attention to protect their oral health. In these cases, it’s important to visit our office more frequently so that Dr. Rogge can ensure your teeth are as healthy as possible, and that there are no oral health problems looming. Quality oral health routines for senior patients can include special dental tools to brush hard-to-reach places or to clean around dental appliances, or even mouth washes and rinses to fight decay and gum disease. If you, or a family member, are in need of dental care for senior dentistry issues, please call our Dover, DE office for assistance. We can schedule your next hygiene appointment, or discuss options for fixing decayed teeth, correcting loose-fitting prosthetics, or talk about whatever dental issues are affecting you. Whatever your age, we are here to help. Please call us today to schedule your first, or next, appointment.